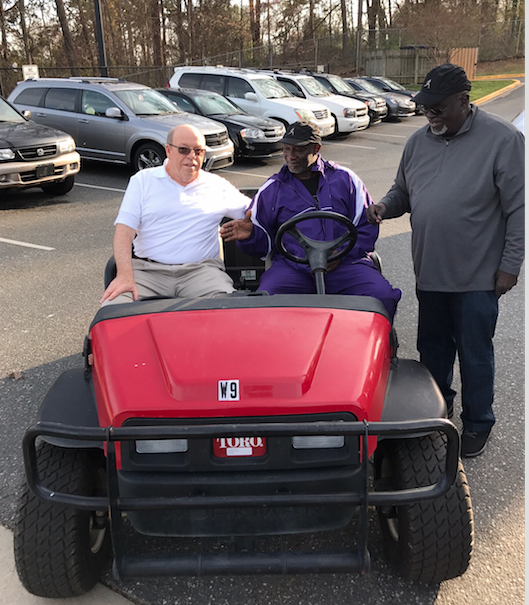 Partners for Parks, a Charlotte-based nonprofit organization, graciously donated a Toro utility vehicle to the Charlotte Flights on Monday, March 20. Partners for Parks president, Doug Youngblood, was on hand at practice Monday to present the vehicle to Flights’ leadership, including Alvin Woods (president), Anthony James (head coach), LeBraun Evans (vice president) and Regina Johnson (board member). The utility vehicle will be a significant asset to the Flights, as it enables quicker navigation of track facilities and easier hauling of equipment. Both will prove beneficial during practices and track meets managed by the Flights. Established in 1996, Partners for Parks is a 501c3 organization that raises funds to support park and recreation projects and advocates for healthy lifestyles. To learn more about Partners for Parks and how you can support and get involved, visit www.partnersforparks.org.